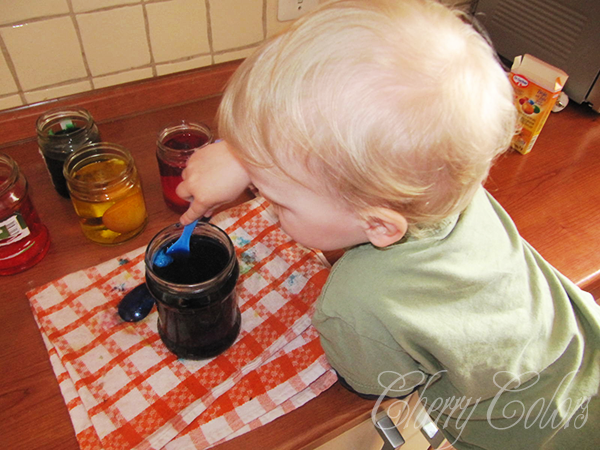 Mom diary: 21 months old - Cherry Colors - Cosmetics Heaven! I AM LATE AGAIN. I had in mind that I still have like half a month of this post, but damn... I came to check my posts (and schedule some new ones) and what do I find? This, not even written or anything.. a draft! But lets focus on my beautiful baby boy that is growing up so quickly. Time flies when you have a kid. You see him change and grow, when you are still the same (quite). The month he turned 21 month old was the Easter month. 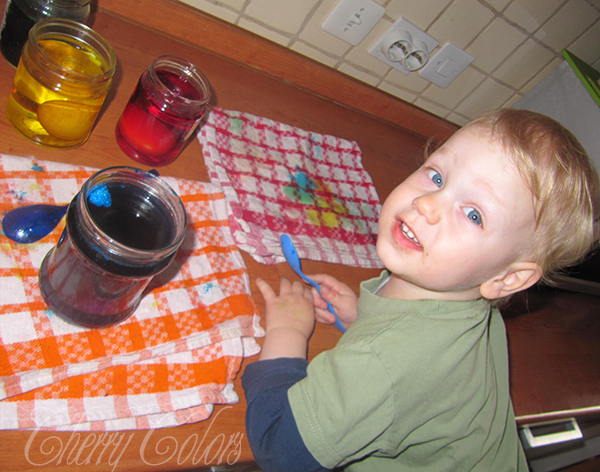 We dyed the eggs together and he was really eager to help me. I let him push the eggs in the jars around and he was a little happy monkey. Heart warming! 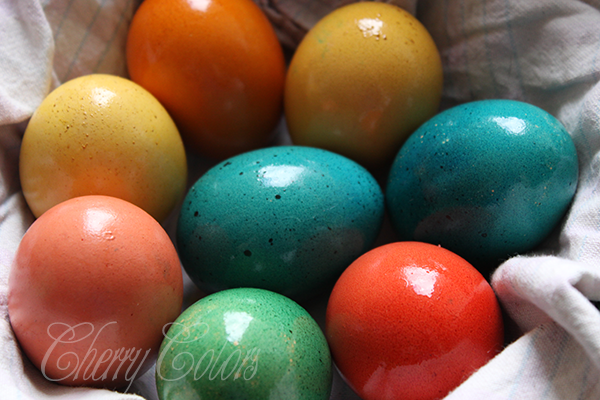 Also the eggs turned out to be really pretty. Next year we will try with those wax pencil thingies :). He is still a big fan of selfca pictures and snatches them whenever he gets the camera. I wonder what will happen once he gets his own phone :P. Just joking, I would never touch a phone of a teenager (privacy and all that). He is slowly graduating into taking pictures of other items, not just table-level but he is actively holding the camera while taking pictures. He seems to be a quick learner. Excited that mommy got mail! The learning to talk phase is still going strong and he just won't shut up! It is cute, but can be quite annoying if I don't understand what he wants. You know, he doesn't say the whole word, just the last couple of letters. And then understand what he is saying. Usually we understand him quite fine, but sometimes we just don't. And then he gets frustrated and has a little tantrum. I am happy to say that he knows how to play alone. It is true that it doesn't last longer than half an hour, but it's all good. That's some quality me time right there ;P. Luckily he started to discover his 'old' toys, which were in his box for some months, forgotten. He saw grandpa fixing things and now he wants to do it too. He is fixing his car and several other toys. He gets creative with that too! His current favorite activity is the swing. He just looooves it! I still love it, even if I am getting older and I always had a love for it. The first time he held onto the swing alone (and strong! ), I swang (?) him hiiiigh. He was screaming with joy and didn't want to get off for two full hours. I am not even kidding! You know who was pushing that swing the whole time? That's right, me. That's love. :P I didn't even get bored... he was way too cute! I am very happy to say that he loves both sides of gramas/grandad. He is super excited whenever he goes to visit any of them! 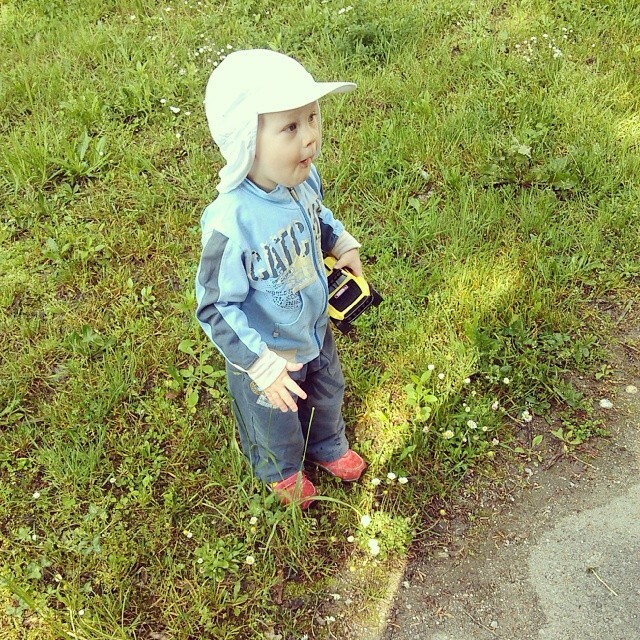 :D Family reunions are fun fun, because he wants to see, try and do everything.